The coastline of Hudson Bay near the town of Churchill, Manitoba is blanketed with ice as frozen masses float around the bay. Under a hazy fog sitting over the Hudson Bay near Churchill, Manitoba, large frozen masses of ice can be seen floating on the surface of the water. The landscape along the coastline of the Hudson Bay is a sheet of white which is frozen and it will remain as such until the Spring melt. 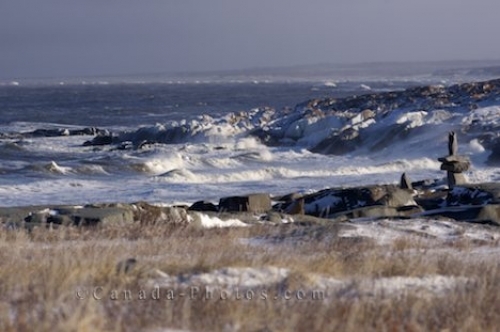 Rugged icy coastline of Hudson Bay in the town of Churchill, Manitoba, Canada. Picture of the frozen coastline of the Hudson Bay near the town of Churchill, Manitoba.